PROTOTYPE INSPIRATION - These photos were the primary inspiration for my Dundon scene. 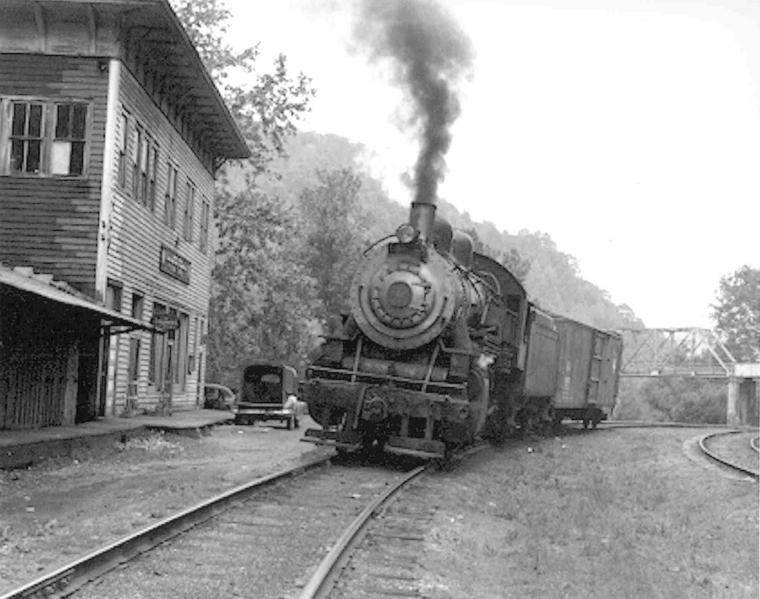 Below is a photo taken from in front of the company store showing the bridge that spanned the Elk River. I modeled one section of both types of spans and a small section of the river. A compressed version of John Lanham's house is also modeled. On the left is a photo I took of the bridge during a visit to the site in 2007. 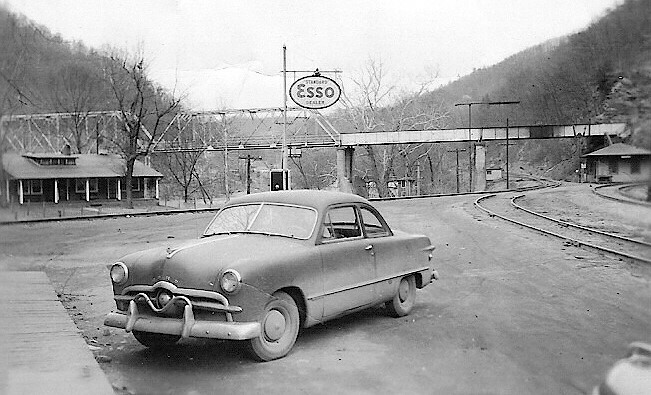 The pump house just above the trunk of the car is modeled. The truss bridge is also visible in these two images. 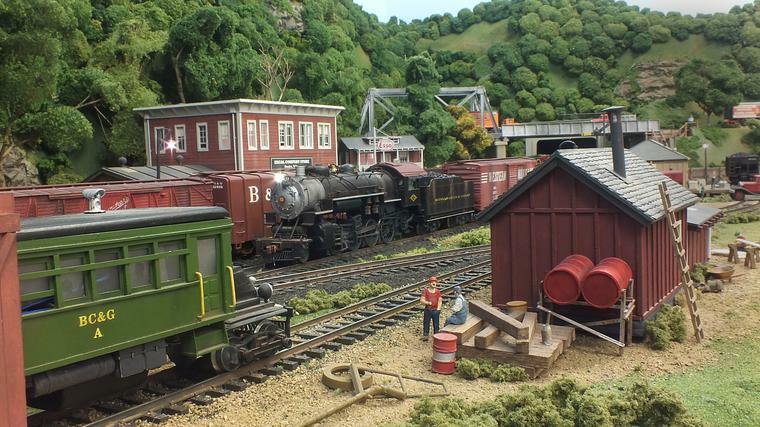 The one on the right is one of the few showing a B&O Q-3 at the Dundon station and it provides excellent detail of the bridge. The left image shows how close the store was to the BC&G track. 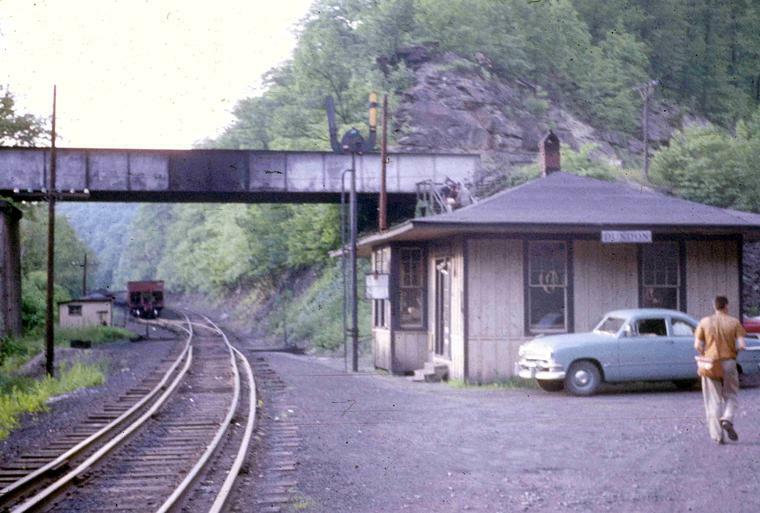 The larger of these two little B&O sheds that were just beyond the highway bridge is on the layout between the highway bridge and the tunnel where the track disappears into the wall. The rock outcropping above the station is represented on the layout. 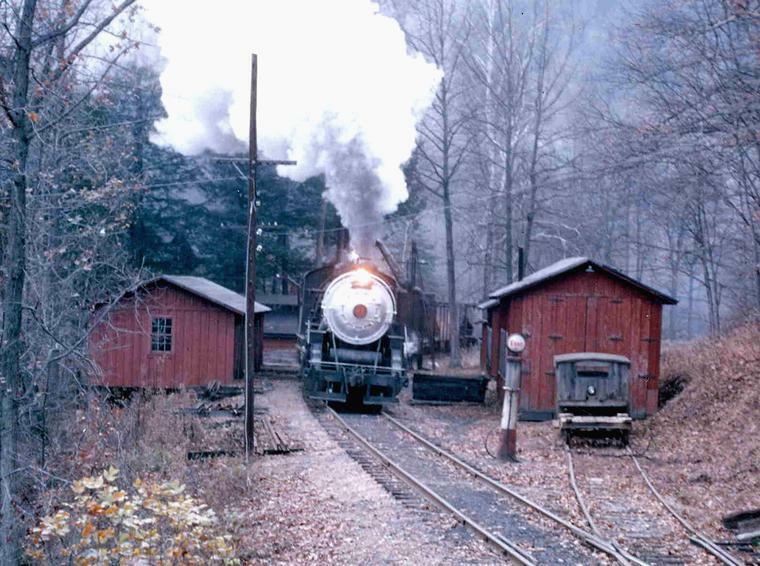 The sheds in the picture on the left are just visible beyond the bridge in this picture. The stairway behind the station is modeled. 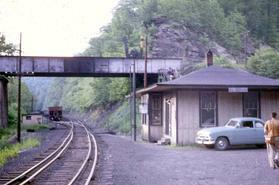 This is Bower's Coal Sales which was located on the 'coach track' behind the station. A slightly expanded version is in the proper position on the layout. The two photos above show a number of details that were along the main line outside of Dundon. (See diagram here). On the layout the bus barn, the MOW shed and the speeder shed have been relocated to the siding that runs behind the station. The old tank car body that provided water to the plug which is just visible in the left photo is on the layout behind the ice house. The water plug it correctly on the main on the layout. In the foreground of the left photo is a foot bridge. A simplified representation will be modeled. 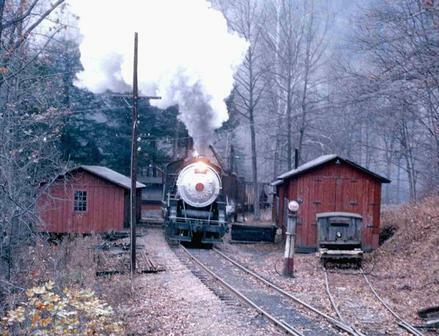 The ice house just visible to the left of the loco in the right photo is located on the lead to BC&G yard staging. The gas pump is correctly next to the bus barn. This overview of the finshed Dundon scene shows the location of major structures and details modeled from the prototype. From left to right: a) foot bridge, b) Bradley's house, c) Hobo Cave, d) water column and valve shanty (hidden behind bus barn), e) bus barn, f) gas pump, g) Buffalo Creek, h) old tank car body feeding the water plug, i) ice house, j) company store, feed building, grease rack, k) MOW sheds, l) Latham's house, m) B&O station, n) Elk River o) county road bridges, p) pump house (just above box car), q) B&O shed (to right of box car), r) stairway to station, and s) Bower Coal. Compare to the PROTOTYPE INSPIRATION photos at the bottom of this page. BC&G Consolidation #13 is making up a train in preparation for the run to Swandale. Motor "A" and her crew will depart after the steam engine gets out of town. 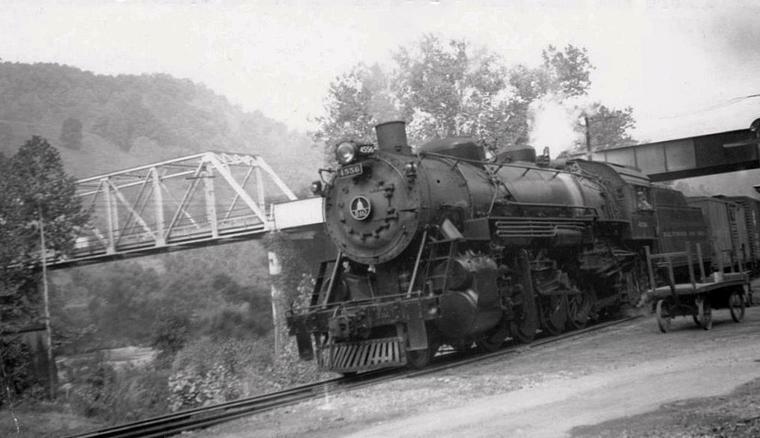 Notice the girder and truss bridge in the background that carried the county road above both the tracks and the Elk River. BC&G Motor "A" pokes its nose out of the bus barn and this time it's leased B&O ALCO RS-1 #9185 handling the train of hoppers that it has just brought to the interchange from the load out at Bonetown Gap. 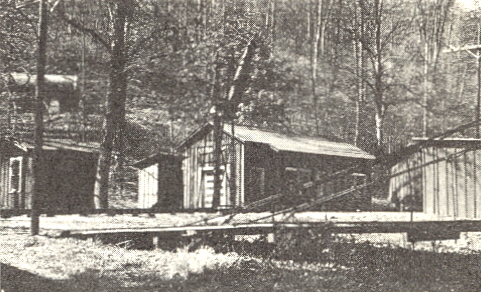 The ice house is across the tracks. 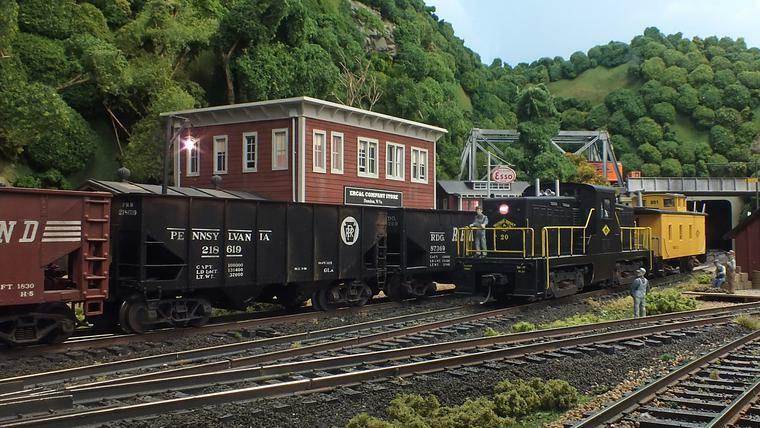 BC&G Whitcomb #20 and Caboose C-2 are preparing a short string of empty hoppers for the trip to the Majestic Mining's coal loading operation at Bone Town Gap. One crew member is riding on the locomotive while another 'supervises' from the ground. 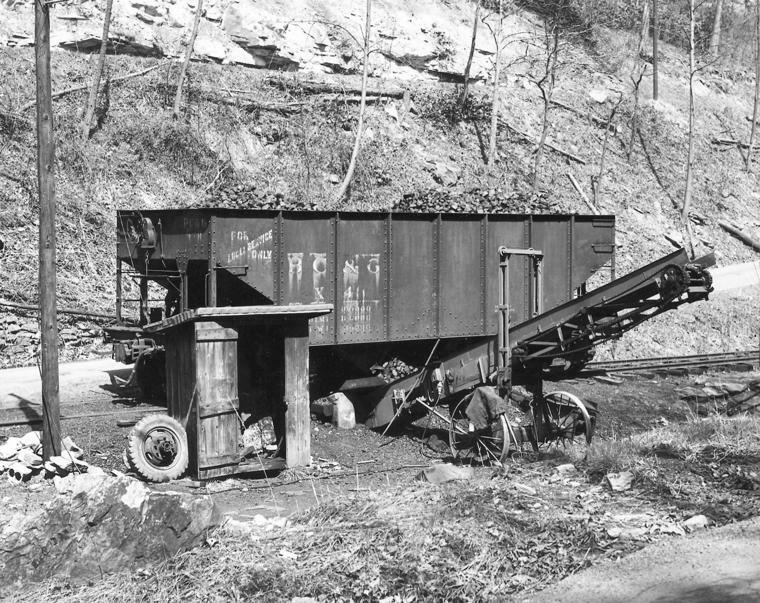 Two more are apparently on break near the shed on the right..
Cody Burdette had a 1941 Dodge 1-ton flat bed truck with side slats that he used to deliver coal which he loaded at Bower's Coal in Dundon. I built this representation of the truck from parts from several models. 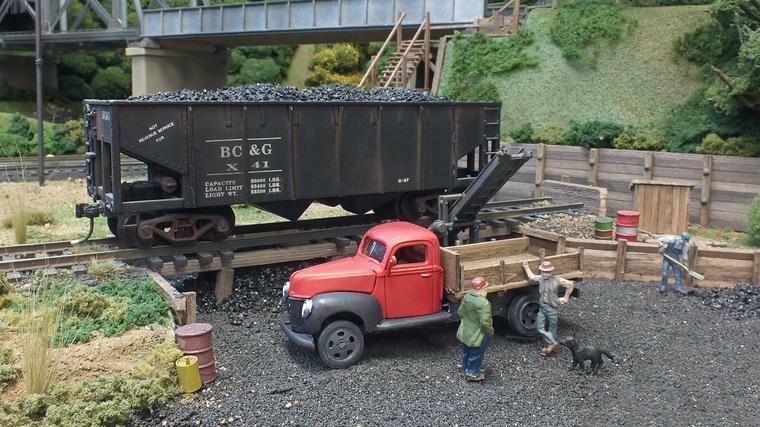 It shown here sitting at Bower Coal on the new layout. Cody had a black lab named Chum who rode with him everywhere in the truck. That's Chum in the photo! Compare this scene to the Prototype Inspiration photo at the bottom of the page. 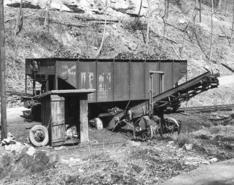 The hopper was modeled from the photo using an AF hopper shell. 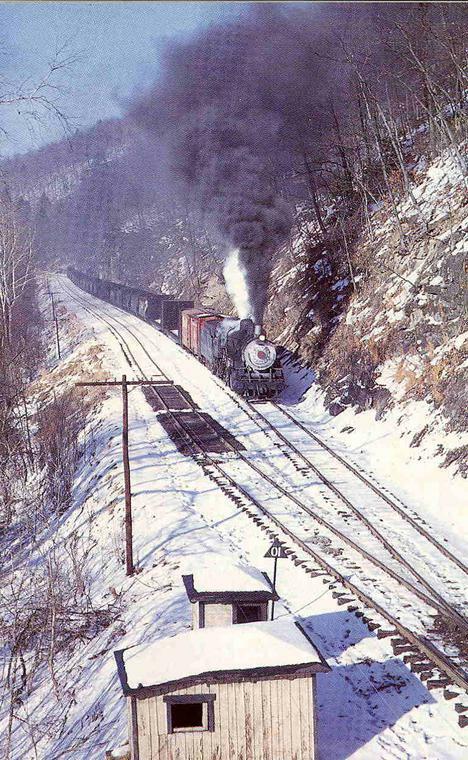 BC&G Motor "A" is seen here crossing the Sand Fork Bridge. The poured concrete center pylon was constructed when the bridge was repaired in 1960 following the dynamiting of the bridge in 1952. 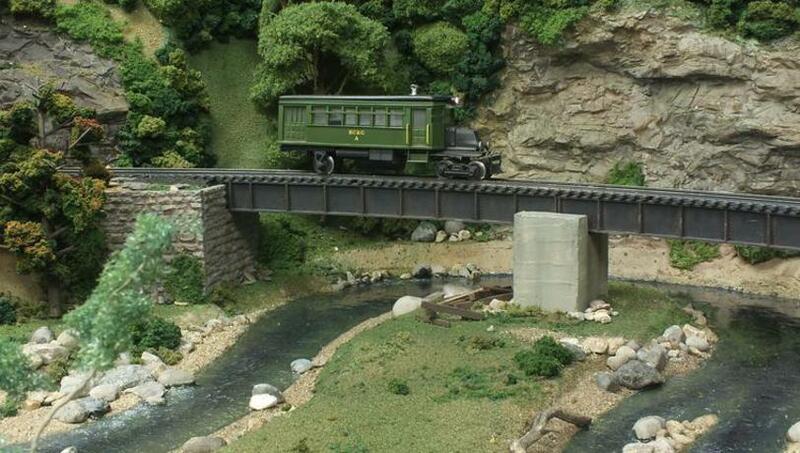 The water in the creek was made using Woodland Scenics "Realistic Water' and Modge Podge acrylic medium. 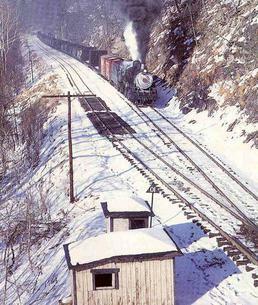 BC&G #14 has arrived in Dundon with box cars of finished lumber to be set out on the B&O interchange. On a hot day the worker has found it wise to do his wood working project under the shade of a couple of nice big trees. The old Mack truck has seen better days. Maybe some enterprising guy will come along and restore the relic.